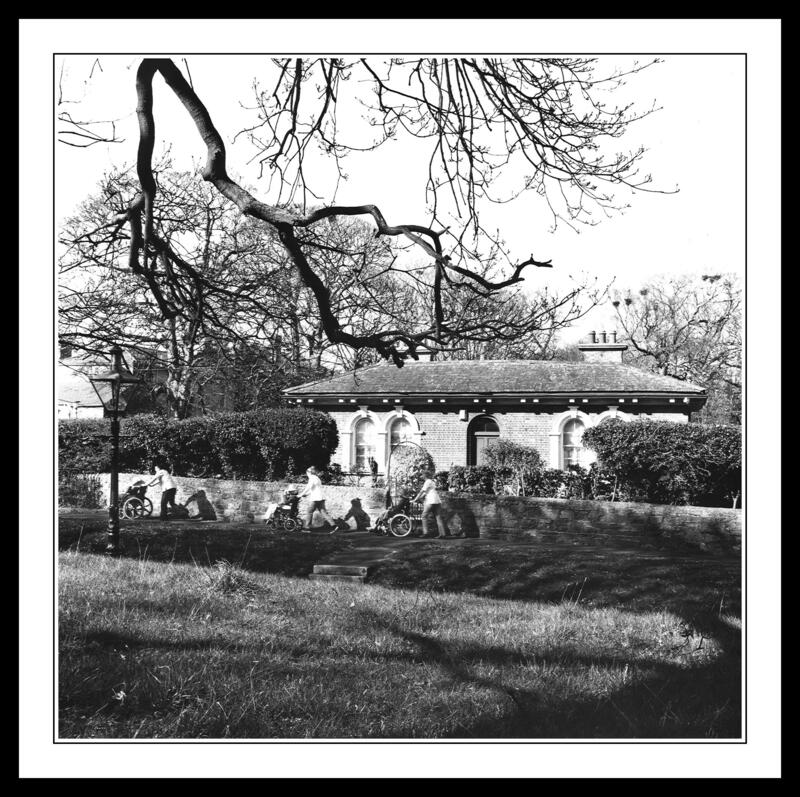 This photograph was taken in a well hidden location of the park somewhere between the Castleknock Gate and Ashtown Gate not too far from the very beautiful Whitefields Lodge. It’s another one of those hidden wildernesses that I stumble upon from time to time in the park and end up spending hours rambling around without seeing a single person. 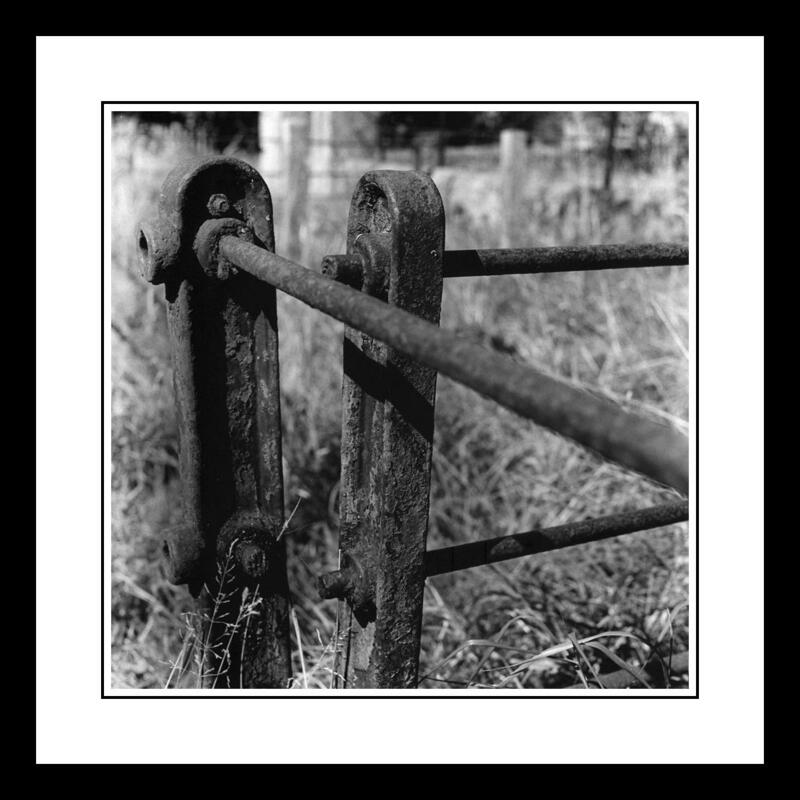 The textures and tones of the rusting old fence were just perfect for a black & white print, if possible I would recommend clicking on the image and viewing it full size on your screen to really get the full effect. I took this photo several months ago on a Bronica 120mm film camera using Kodak film. 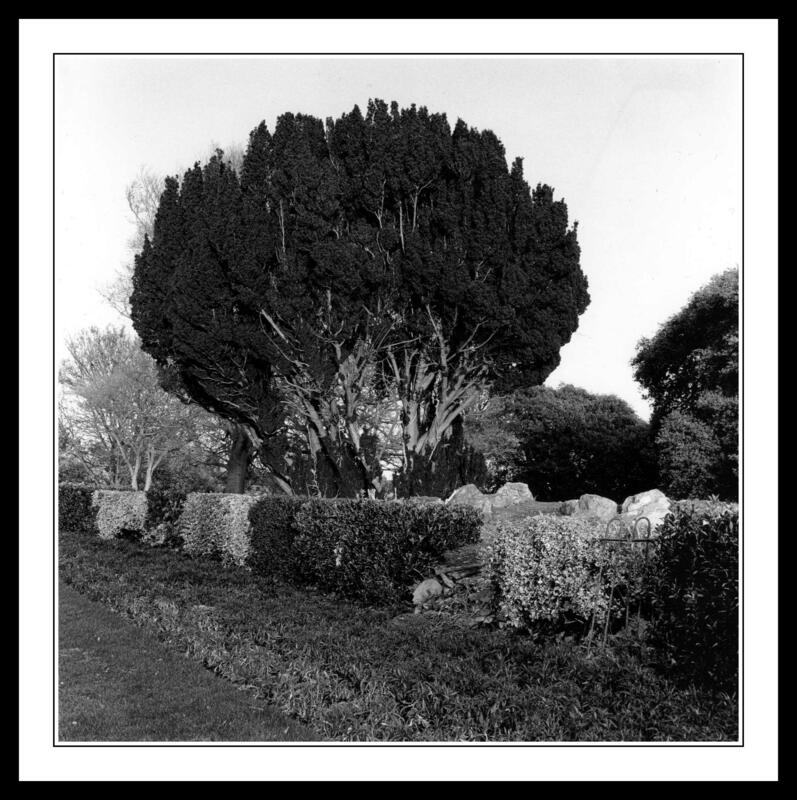 The print was made by hand in the darkroom and printed on Kentmere paper. At this stage you are probably well aware of my minor obsession with trees and their many different shapes and personalities. 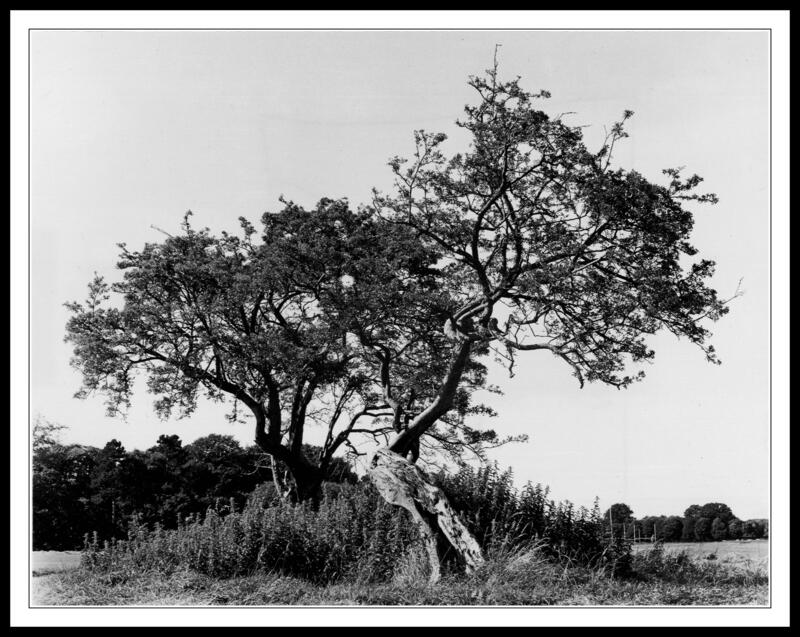 To those people out there who think I may be a wee bit mad to think trees have personalities then have a look at this old guy and try tell me he isn’t riddled with all sorts of character. Believe it or not I only discovered this particular old creature a few months ago and then we spent a wonderful afternoon together. 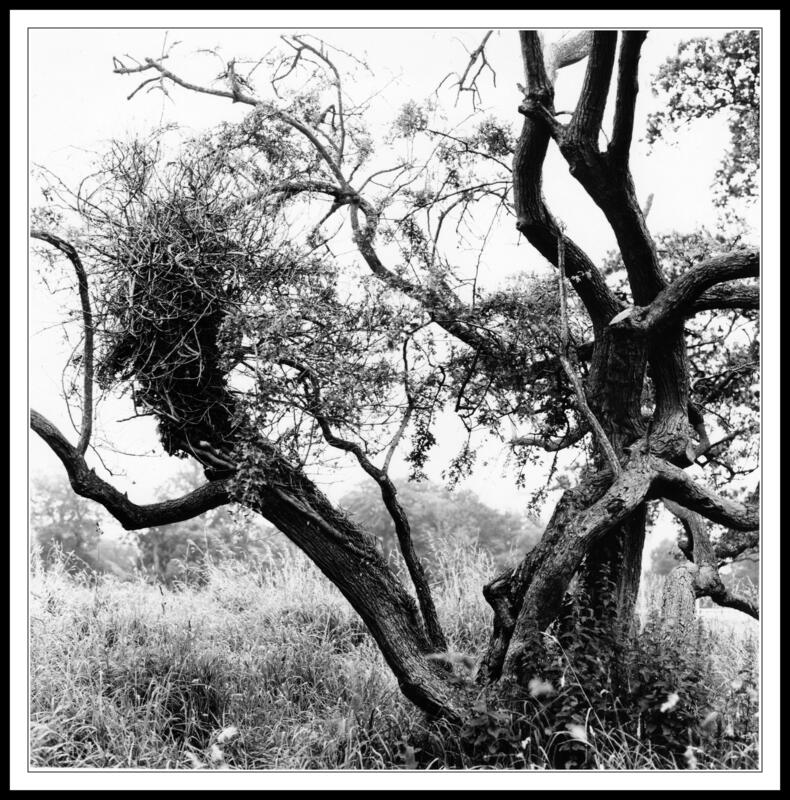 When I find a tree as beautiful and full of character as this one I tend to just sit down for a while in various spots away from the tree and slowly make my mind up about how I am going to try and capture it on film. If you just rush straight in with the camera you may not give yourself the time necessary to get acquainted with the trees surroundings and they can be just as important as the tree itself. This old guy seemed to be totally at one with the long grass, wild nettles and in particular the ivy that at first seems to be trying to take over the tree. After a while I began to realise that the tree and the ivy were pretty much living as one, each one needing the other to survive. Ok, so the ivy genuinely does need to the tree to survive but the tree may not necessarily need the ivy but if you look at the branch growing up from the left of the photograph the ivy growing at the top of it actually looks like some kind of winter warming hat sitting on top of the branch. You may need to view the photograph slightly larger to see exactly what I mean but if you do so briefly and come back to me then you may see the slightly badly knit hat sitting on the top of the branch, it’s a bit ragged looking but seems to be doing the trick nonetheless. I’m not going to tell you where the tree is though, that’s my little secret. 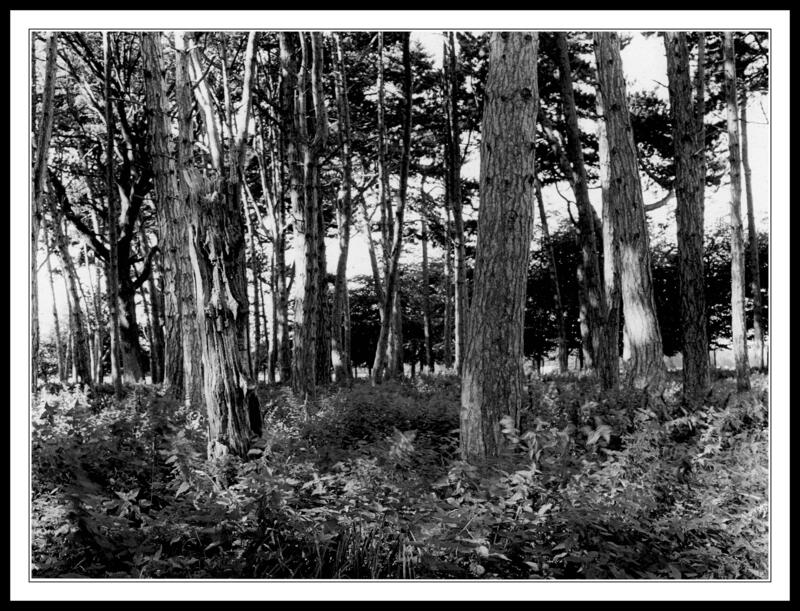 The photograph was taken using a 120mm Bronica film camera loaded with Kodak tri-x 400 black and white film. The actual print was made using my very own hands in a traditional wet darkroom. This very beautiful stone building at Ashtown Gates is known as Bessborough Lodge. It is joined to another gate lodge which you can just about see at the right hand edge of the photograph. There are two lodges at the Ashtown Gates, very beautiful matching brown lodges facing each other at the exit from the park. This particular building was designed by Decimus Burton and was completed way back in 1848. 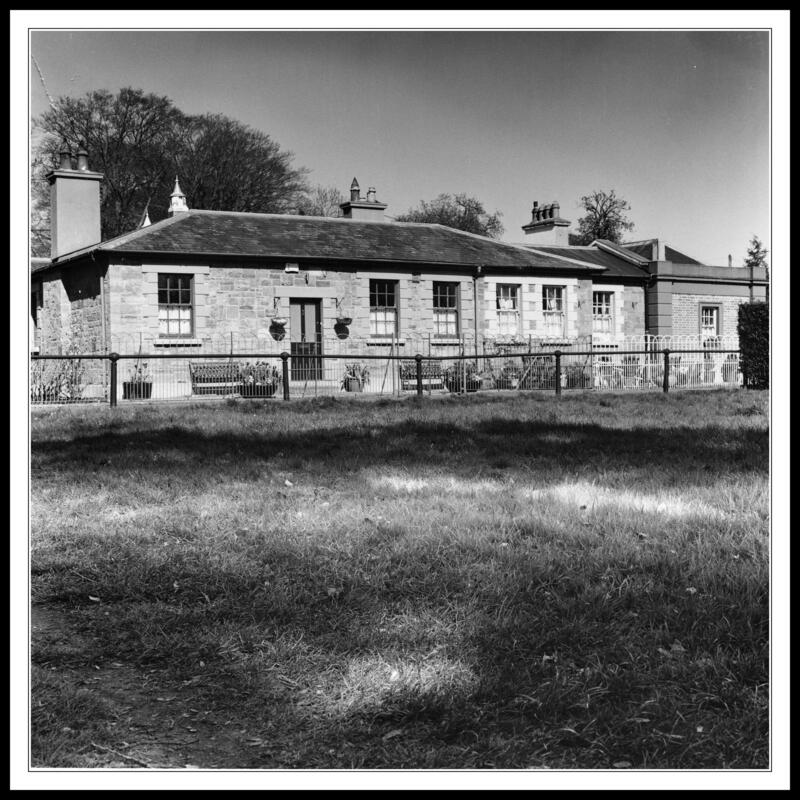 The house was originally built as a police barracks and was used to house policemen serving in the park and also had room to accommodate prisoners. It was obviously a fully serving police station when it was originally built but now it accommodates staff serving in the park. I actually ended up chatting to some people coming out of one of the lodges after taking this photograph and they reliably informed me that the police barracks had several drunk tanks in it. Anybody caught wandering around the park under the influence of alcohol would be swiftly taken away and thrown in the cell for the night to sleep it off. Obviously drunkenness in the park was frowned upon back then, as I suppose it is nowadays too in fairness. Can only imagine how busy they would have been after the Swedish House Mafia concert there last year. I am thrilled to announce my new photography website is finally up and running after many months of hard work. I don’t like to do things by half so whilst getting ready for my first really big exhibition I also decided to teach myself how to build a website in my spare time. It has been great fun learning how to do things like this, it’s very much more challenging than a blog but it’s close to being finished now. If you have some free time I would love you all to have a look and maybe let me know here on the blog what you think of it. I am very much open to constructive criticism, or any type of criticism, it doesn’t really matter. Anyway the site can be viewed at www.davekphotography.com. There is just something about a tree lined avenue that I simply cannot walk past without plonking my camera down on a tripod and letting the shutter go click. 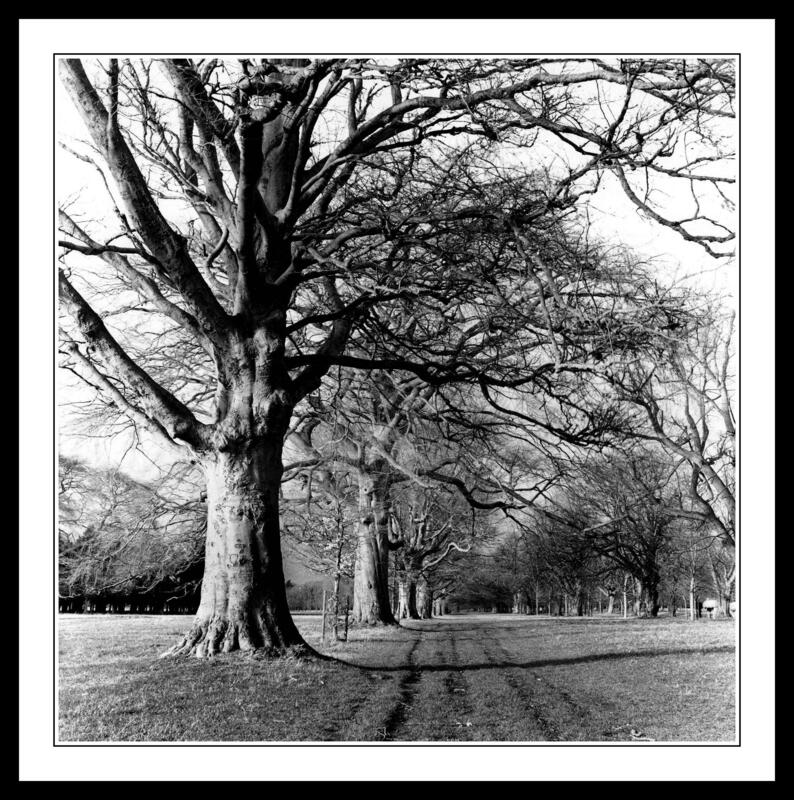 I was actually out for a stroll a few weeks back on a very determined mission to try and continue my quest to photograph the lodges of the Phoenix Park. I had taken my bicycle with me to the park for a change, if you saw the size of my Bronica camera and tripod you wouldn’t really wonder why I drive all the time. I had this very precarious set-up which involved some old fashioned sturdy elastic straps to keep the tripod attached to the crossbar of the bike. A disaster waiting to happen really. Thankfully, said disaster happened whilst I was cycling in soft [and quite long] grass. Basically the elastic made a sound like “Boing”, the tripod fell to the ground and I had to make a very rapid stop, before I lost my tripod. I was pretty lucky the strap didn’t catch one of my legs [or something further up] as these things are like some old torture aid. Anyway, I saw this scene and I started photographing. The lodges can wait, they ain’t going anywhere in the near future. 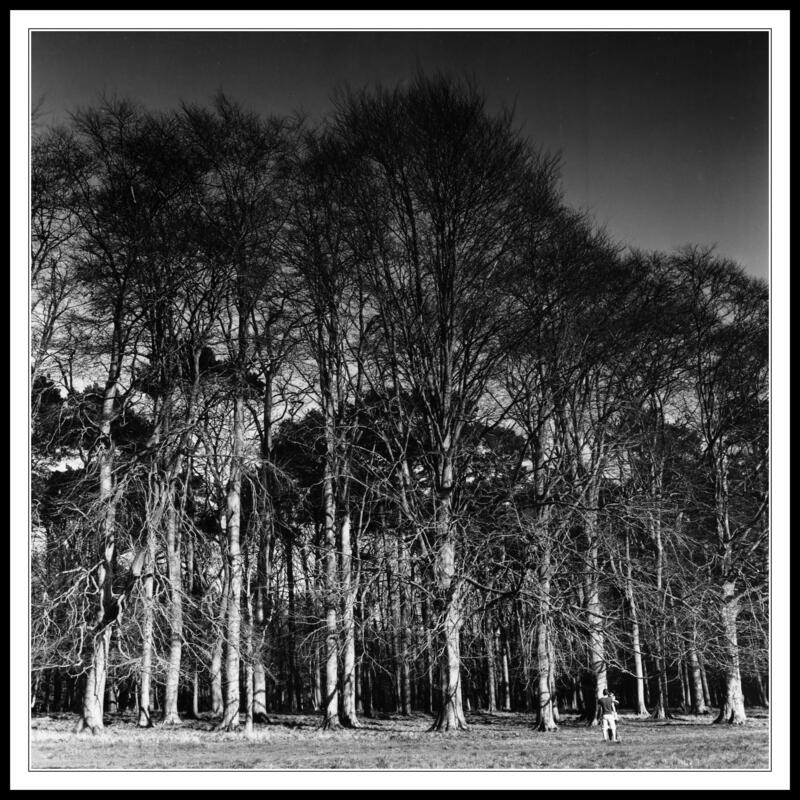 This photo was taken on a Bronica medium format camera using Kodak Tri-X 120mm film. The print was made by my very own hands in a traditional wet darkroom.